EDIT: Giveaway is officially over. Congratulations to Rosanne Morrison for submitting the randomly-chosen 387th entry. Forget fighting the crowds in the summer, I'd rather take a spring stroll along the beach. The water may be too cold to swim, but watching the waves roll by is relaxing. One winner will get to enjoy the tranquil colors of the ocean every day, no matter the season. 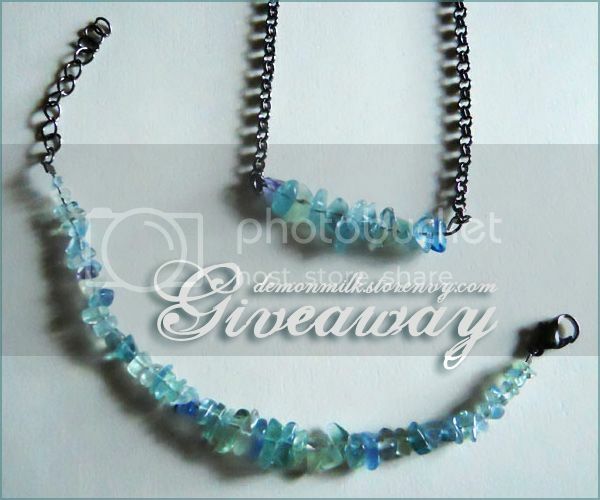 Vi from Demonmilk is giving away the fluorite jewelry set above. Fluorite was named from the Latin noun fluo, which translates as flow of water. The colorful crystal is believed to neutralize negative energy, so anyone that wears this set should feel pretty swell. Each piece is strung with several fluorite chip beads. Attached to the beautiful bracelet is an adjustable gunmetal chain. The matching necklace's chain is long enough to loop over head. While other little girls were simply fawning over fairytale fashions, Vi was learning how to sew them from her grandmother. Now her fashion label offers designs with a unique gothic twist, from wayward Victorian skirts to tatted jewelry. My international readers' hearts may turn black with despair after realizing they can't own Vi's handmade creations. She lives in such a rural area that the only post office even remotely near her home no longer ships worldwide, and thus, unfortunately, her giveaway is only open to entrants with addresses in the United States. Use the Rafflecopter below to enter to win jewelry giveaway before 11:59pm EST on April 30, 2014. Be sure to leave the mandatory comment on the blog post with the same name you use to fill out the Rafflecopter - all entries by winner must be easily verified or a new winner will be chosen. I like the black key choker very much. It's all beautiful! I like the Aura Quartz beaded necklace and the Death & the Maiden necklace very much. I adore the Aura Quartz Beaded Necklace and the Rib Cage Necklace. I love the Auro Quartz Beaded Necklace and all the bloomers! I also love the hair flowers! I pretty much love everything there! Hi! What a cool shop! My favorite is the Kandi Kid Paradise Package. So colorful & fun. My name is Natalie Brown & email is natorama99@yahoo.com Than-you! aura quartz beaded necklace (http://demonmilk.storenvy.com/products/6505618-aura-quartz-beaded-necklace) is very very pretty. 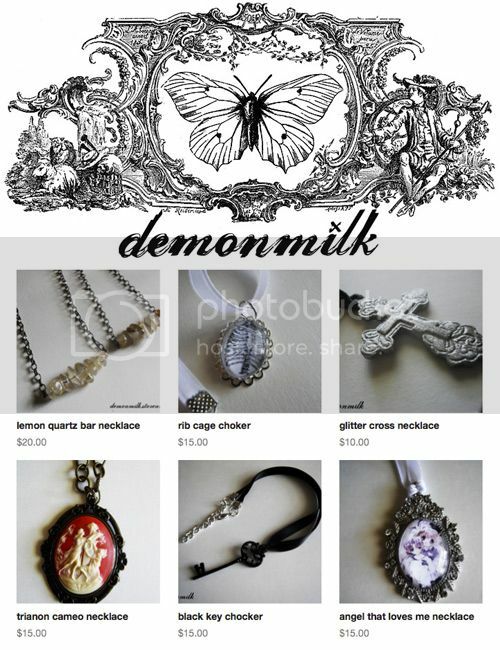 I also really like the hepburn choker (http://demonmilk.storenvy.com/products/912080-hepburn-choker-destash). I like the Marilyn Monroe ring. It's awesome. I like aura quartz beaded necklace. I like the colours- have always loved the sea. My favorite is the angel that loves me necklace. I love the aura quartz necklace. I love the labradorite bar necklace. I like the glittered cross necklace. I'm kinda obsesed with the lemon bar necklace thingie of prettiness! I like the labradorite and pearls necklace. I love the cameo necklace! I have always loved cameos, so the trianon cameo necklace really caught my eye. Love the black key choker! Love your black key choker! Thank you for the giveaway! Audrey Hepburn is my muse! LOVE the aura quartz and beaded necklace! My favorite item is the aura quartz beaded necklace. I like the byzantium necklace. They all are very nice, especially the black key chocker. I like the layering necklace ! I like the point of antiquity necklace. I like the aqua quartz necklace. The angel that loves me necklace. I like the skull ring. I like the ice beaded quartz point necklace. I love the glittered cross necklace. I love the "ice beaded quartz point" necklace. My favorite piece is the wonderland hotel key necklace. aura quartz beaded necklace is gorgeous! I love the Ice Crystal Necklace. I love the Heart Ring! I love the black key chocker. I like the aqua QUARTZ BEADED NECKLACE AMONG OTHERS. I like the irradescent layering necklace.